to facilitate all the steps involved in dialysis. Features Adjustable Armrest Adjustable Footrest Pretreated and Powder Coated. CRCA pipe frame work with three section top. 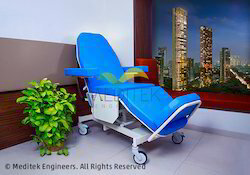 Electrical Operation –Backrest ,foot rest , Trendelenburg and Reverse Trendelenburg and Height Adjustment with Four actuators. Looking for Dialysis Support ?